By far the simplest and quickest way is to use one of our sauces. They’ve been expertly blended to give a great taste but in as short a time as possible. All you need do is fry some onions, brown off whatever meat you’re using, then pour over a jar of sauce and simmer for around 15 minutes. Easy, delicious and it definitely doesn’t count as cheating. Fry onions in oil until soft. Add some curry spice paste and gently cook for a few minutes. This allows the spices to release all their • wonderful flavours and aromas. Next add your meat or vegetables and cook until sealed. Finally add some water and leave to simmer for 15-30 mins depending on the recipe. So a spice paste does take a little bit more work than a sauce, but we think the end result is well worth the effort. 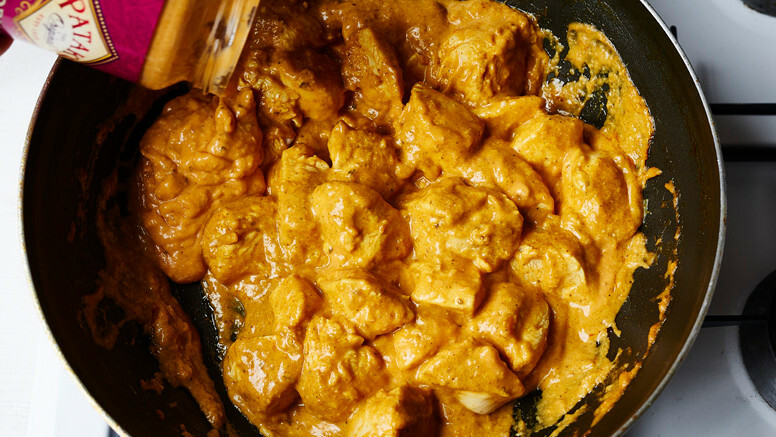 A lot of Indian restaurants and curry houses make their curries using our spice pastes, so it really does give you that great authentic taste without the fuss of cooking from scratch. Plus our spice pastes are really versatile – unlike the sauces you can add more or less spice paste to the recipe depending on how rich or spicy you like it. And you can use it in loads of other recipes aside from curry – like marinades - they are a great way to add spice and flavour to any dish. We have lots of recipe ideas using spice pastes on our site, so take a look. Of course, the most authentic way is to cook the curry from scratch. It involves getting all the whole spices you need and grinding and blending them yourself. Or you can buy all your spices already ground. Once you’ve done that the process is fairly similar to using a spice paste (but just takes a bit longer.) But if you want to give it a go, check out our recipe section for some ideas.